If you were in San Diego for Comic-Con preview night last night, then you were treated to select footage from The Conjuring spin-off The Nun and a first look at IT 2. 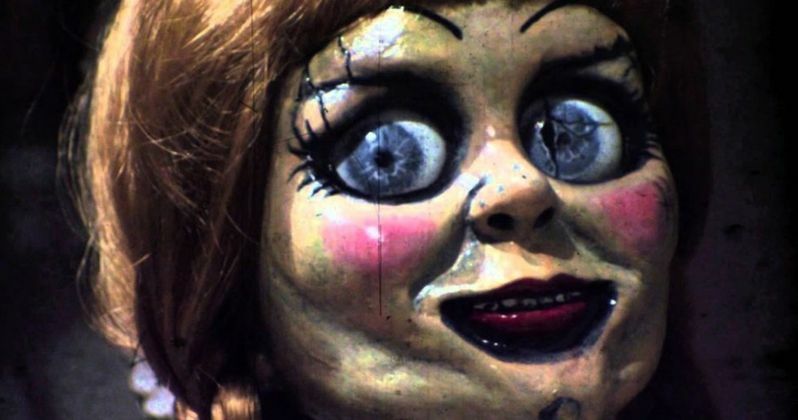 Among the other frights handed out on stage was the official confirmation that Annabelle 3 is happening. And it promises be the scariest installment yet. Yes, that creepy killer doll is coming back. No, she won't be fighting Chucky in what many hoped would be the ultimate crossover movie. But perhaps we're getting something cooler. This time out, we will return to the Warren's museum of haunted nicknacks. And we'll get to see what Annabelle is up to when Ed and Lorraine are away. That sounds sufficiently creepy right? The main plot of the movie finds other artifacts inside the Warrens' home coming to terrifying life to stalk and taunt Ed and Lorraine's daughter Judy Warren. Director Gary Dauberman and producer James Wan were on hand to deliver the information to the crowd at Comic-Con. Annabelle was first introduced in The Conjuring. Despite only having limited screen time in that James Wan directed fright fest that spanned its own cinematic universe, the doll proved to be quite popular and got her own spin-off movie in 2014. It was a hit at the box office, but the movie itself left a little something to be desired. In 2017, we got Annabelle Creation, which really knocked it out of the park with fans and critics alike. Those two movies went back in time, before she joined the Warrens and took a place in their museum. Now, Annabelle 3 will explore what happens after they have her in possession. We'll get to see what she's up to while in custody of the two demon chasers. The story will unfold shortly after the events of the first Conjuring. The plot explains what happens after Annabelle is placed in that room with those other cursed objects. The Annabelle demon will use her powers to bring the other artifacts screaming to scary life. The sequel is being describes as Night at the Museum. And it has the potential to be heart-stopping. The Conjuring universe has proven to be a big moneymaker for Warner Bros. The first movie was a huge hit, taking in $319 million worldwide from a small $20 million budget. From there, we've gotten The Conjuring 2, the two Annabelle movies, and next up is The Nun. The Conjuring 3 is currently in the works, as is a movie about The Crooked Man. The Conjuring universe movies are all based somewhat in fact. And that includes Annabelle. The doll was a real-life possessed plaything that the Warrens picked up on their journeys, and it is well documented in their case files on the paranormal.